A sitting dove and a standing dove in dolls house scale. Photo copyright 2010 Lesley Shepherd, Licensed to About.com Inc.
You can make these dollhouse or scale miniature white doves or white racing pigeons from a range of materials, two part epoxy putty, polymer clay, or air dry clay which I used for the photographs. The techniques are very similar for all the modelling materials. All the different materials have some advantages. Lightweight Air Dry Clay - I used Delight Clay - which has the advantage of being very light weight but needs a protective painted coating. Birds made with air dry clay can nest in branches or hang on tiny trees without pulling the tree branch down. The Delight clay rolls very thin, and when pulled apart has the effect of tiny feathers on the edge. The best tips for light weight air dry clay are to work on a piece of glass to keep the clay clean, only remove very small amounts of clay from your carefully sealed stash for each stage of the build, and to use a soft paint brush to blend the joins between sections. You need very small amounts of this clay. Keep the open package in a resealable bag with the air removed and only take out tiny amounts for each step. Two Part Epoxy Putty - Air dries or cures to a very hard finish, can be sanded and painted, can have sections added on as you build. This makes birds which are heavier than the ones made from air dry clay, but they are less prone to breakage. As with the air dry clay, only mix small amounts of putty for each step. Blend two part epoxy putty sections together with a bit of water on the surface using modelling tools or a dampened finger. Polymer Clay - Easy to sculpt and blend, colors should be mixed and added for the various sections, rather than painting the finished model. Polymer clay is heavy enough to bend small branches, so you may need sturdy trees for polymer clay birds. The basic body shape for a scale miniature dove show beside a dolls house cage for scale. 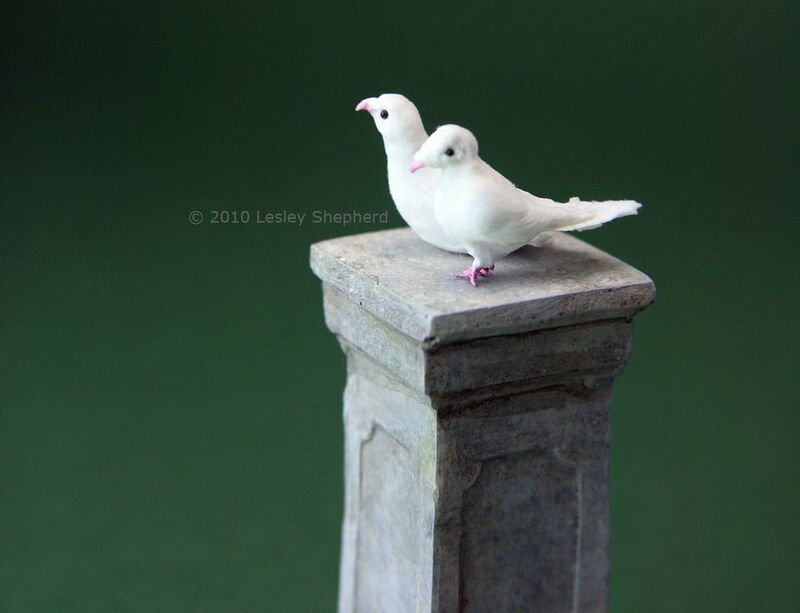 Photo copyright 2010 Lesley Shepherd, Licensed to About.com Inc.
Doves are small bird to model in dolls house scale. To make it easier to work in this size, begin by modelling the body to get it the correct size, then add the head and adjust the shape before adding the legs. Try to work from a photograph to build the body which makes the breast of the dove and its belly. The main body shape is a small triangle with a gently curved back. the dove will measure roughly 1/2 inch from the front of the body to the base of the tail (the section of the body you are modelling now. You will be adding more material for wings and a tail in future steps. The main body is just the support piece that you will model the rest of the dove on. If you will be placing the dove in a cage, or on a doll's hand, check the rough body shape against the cage or hand to check the scale. The rough shape of the body should have a slightly rounded neck section and a wider base. If you are using air dry or polymer clay, use a brush (damp for air dry clay) to smooth the clay in the area of the neck and breast. Before you go on to the next step, squeeze the body where the tail should join to make a thin tail that is attached to the body. Don't worry if the length of the tail is incorrect, you can add more material later. Set the head and body aside to dry, cure or stiffen up (polymer clay) so that it will be easier to finish the sculpture. It is easier to sculpt a miniature dove's head separate from the body. Pay attention to the curve of the beak and the position of the eye. Photo copyright 2010 Lesley Shepherd, Licensed to About.com Inc.
To make a dove's head and beak, roll a small ball of your modelling compound. I used a ball just over 1/8 inch in diameter. Use your fingers or a set of tweezers to pinch a beak out of the center front of the head. I put the head on a small embossing tool to help hold such a small model. Don't worry if the holder works through the top of the dove's head, you can fill in any gaps when the head is attached to the body. Right now you want to make the beak and place the eyes. Use your tweezers or your fingers to pinch the beak on one side and then the other to shape it. The beak of a pigeon or dove is quite short, slightly durved and pointed, and fairly sturdy. Don't worry about the shape of the face, you can adjust that later with additional putty or clay. It is a good idea to have a photograph of an actual dove to work from. A dove's beak curves down slightly at the tip. Add tiny eye holes to your head where you can insert no hole beads or tiny balls of dolored modelling compound for eyes. The eyes on a dove are fairly inset and usually dark (especially for doves kept in dovecotes or used for wedding releases. Before inserting the second eye in your dove, mark its position by examining the dove face on with one eye inserted. You want to make sure the second eye is positioned in line with the first across the top of the beak. If you will be painting your dove after it is baked or cured, don't glue in the eyes until after you have finished painting the bird. If you are using polymer clay or air dry clay, you can set the eyes in place now, or later in your sculpture (in case the bird's head shape shifts as you continue to model your bird). With the head attached to the basic body shape, the dolls house scale dove is checked against the cage as a scale reference. Photo copyright 2010 Lesley Shepherd, Licensed to About.com Inc.
Once you have the head attached to your dollhouse scale dove, check that the bird is the correct scale by holding it against a cage, doll, or any other place where you might want to position your bird. I designed my woven bird cage to be large enough to hold two doves, so I want to make sure the doves will fit in the cage before I finish my dove's body, wings and tail. Held against the open cage, the dove appears to be the correct size, so I will keep on modelling and finish the wings and the dove's body, adding a bit more of a tail after I position the wings. Beading wire is grouped an twisted to make the feet and legs of a dolls house scale dove. Photo copyright 2010 Lesley Shepherd, Licensed to About.com Inc. The racing or homing pigeons released at weddings and funerals as white doves, have tiny feet and legs which are mostly covered with feathers. They are best made out of fine gauge wire. I used 36 gauge beading wire and painted it with acrylic paints. To Make the Feet For the Dove - The doves shown are in 1:12 scale. Adjust the measurements if you are making doves for larger or smaller scenes. In the photos I show one sitting dove (without feet) and one standing. If you have difficulty with the feet, make all your doves sit! Cut four, 3/4 inch lengths of fine wire. Twist the wires tightly together leaving the wire ends slightly free at both ends of the twist. (see photo). Bend the twisted wire in half to form a set of legs with feet. Make sure your wire will be fine enough to insert into the base of your bird and the length of the feet will be short enough that the wire won't protrude through the bird's back when inserted far enough to make appropriate feet. Use wire nippers to trim your legs to length, 3/16 of an inch of wire from the bend on either side is about right. Spread out your bird's toes - The feet of doves and pigeons have three toes facing forward and a 'heel' above the height of the toes facing backwards. Spread the wires on the base of the leg out properly, bending three wires flat at the front and one at the heel. make sure your set of legs match in length or rebend your wire. Use a set of wire cutters or nippers to trim off the four toes of your bird so they are approximately 1/32 of an inch (2mm) long. Paint the legs and feet with tube (not liquid) acrylic paint. The feet of racing pigeons are usually grey or grey pink. Make sure the paint covers only the individual toes. Half moon shaped wings are attached to the body of the dollhouse scale dove. Photo copyright 2010 Lesley Shepherd, Licensed to About.com Inc. Compare your rough body to a photograph of a dove or white racing pigeon in a pose close to the one you want to sculpt. Add extra modelling compound to areas that need to be more rounded, and check the body length for the tail length and position. On pigeons, you may want a pronounced breast area at the front and a very short neck. Check your photo. Add a section for the tail, blending it in to your body. I flatten out a small ball of air dry 'Delight' clay and trim it to the rough shape I want the tail to be, then gently tear the end of the shape to give it the look of feathers. For air dry clay I moisten the tip of the tail and press it gently into place above the rough tail shape I made when I made the basic body shape, blending the top edge of the tail where it joins the body into the back of the dove with a fine damp paintbrush. Continue to shape your dove, checking its balance every once in a while to make sure that it is not too heavy on one side, or on the head or tail end. To check it's balance, set it so that it 'sits' on your work surface. It should sit properly without falling forward, backward, or to the side. If you are using epoxy putty to model your dove, make sure you leave an indentation where the leg wires will fit. You can insert the leg wires into the gulls body when you have the main belly shape finished, and allow the putty to harden around the base of the wires to hold them. If you are using polymer clay or lightweight air dry clay you can add the legs after the main body has set up (air dry clay) or stiffened (polymer clay). After the basic wings are attached, the dolls house scale dove's feet are added to the base of the body. Photo copyright 2010 Lesley Shepherd, Licensed to About.com Inc.
Take your painted feet and legs and set them into your dove at a point where the feet line up with the back of the dove's neck. The feet will protrude from the body by just under 1/4 of an inch. Take a bit of your modelling compound and use it to fill in the birds belly near where the legs have been inserted. Smooth some of the modelling compound down the legs, doves or pigeons have feathers down their legs almost to their feet. Set the model aside to dry or harden. Note: - the photo above shows the bird's feet in place and balanced, but does not show the modelling clay placed over the top part of the legs, almost down to the toes to model proper legs for a homing pigeon or dove. In later photos in this series you will see how far the 'feathers' cover the legs. When the model bird's feet are firmly set into the body, test the balancing point by setting the dove on a flat surface. Adjust the balance of the bird by adding more weight to the legs, breast, or tail if it is necessary to balance your dove. If You Are Using Epoxy Putty - Insert the legs before the putty sets up hard, perhaps in an earlier step, or leave a hole for the legs, and set them in after the body has hardened, filling around them with more epoxy putty.. If You Are Using Air Dry Clay - Glue the legs into a hole you poke in the bottom of the bird, filling the hole with extra air dry clay if necessary. Set the bird aside to dry. When the birds legs are glued in place, spread them to allow your bird to balance on its own feet. If necessary, you can always hold one foot in place with florist's sticky clay, or museum wax. Set your bird in a likely roost. The wire feet and legs will allow you to place it in a range of positions. If you are using polymer clay, bake your bird after you are sure the feet are in the correct position for balance. Add any necessary painted details after your polymer clay has cured. Two doves at the door of a dolls house scale bird cage. Photo copyright 2010 Lesley Shepherd, Licensed to About.com Inc. When you have your sculpt looking like a reasonable dove or pigeon, bake, dry or cure the body (inserting the leg wires if necessary first) then add final details with paint. If you are using polymer clay, your details should be added in with colored clay. Insert or paint the eyes - Glue tiny no hole beads in place for eyes or make them as small beads of modelling compound. Paint them black if necessary and insert them into the eye socket you made in the head. Paint the Beak - Use a soft grey pink for white doves, pigeons can have other colors of beaks as well. Paint the Head - Use white acrylic if necessary and paint the entire bird white except for the bottom of the legs and claws, eyes and beak. If you are making colored racing pigeons and not white doves, check your photo for the coloration pattern of the chosen bird type and paint it in a similar pattern. Set your painted dove aside to dry. Note: The doves in these photos were made with white Delight air dry clay which makes them light enough to perch in model trees. This clay dries to a very pure white so the birds have not been colored except on the beak and lower legs. If air dry clay models are going to be used in areas of high humidity or moisture, they should be sprayed with a matte or satin artist's fixative after they dry. George, the dolls house garden boy holds a dollhouse scale dove. Photo copyright 2010 Lesley Shepherd, Licensed to About.com Inc. Experiment With Different Poses - Small birds are fairly easy to model, and if you have good photographs for reference, once you can model a plain standing bird, you can go on to modelling one which is preening its feathers or preparing to take off or land. Try to model the same bird in several different poses for experience before moving on to model a different species. If you are modelling pairs or groups of birds, model some in sitting or nesting positions and others standing with their heads cocked at different angles. If your bird model is a complete failure in your eyes, you can always tuck most of its body into a nest where it can't be easily seen! Birds with wire feet can be mounted into positions on cages or in trees by bending their toes over the branch or cage wires, and using glue or tacky museum wax to hold the bird's feet in position. Birds without feet can be set into the hands of dolls using a bit of museum wax. With experimentation you will find many ways to realistically pose birds in your scale and miniature settings.